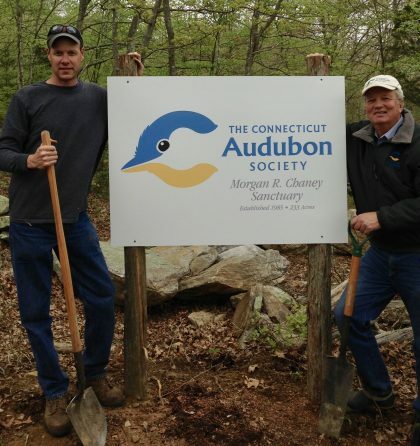 Andy Rzeznikiewicz, left, and Milan Bull after erecting the new sign at the Morgan R. Chaney preserve in Montville. June 21, 2017 — We’re making good progress on several projects to create and improve habitat for birds and other wildlife. One that we want to tell you about one in particular is at the Morgan R. Chaney Sanctuary, on Turner Road, Montville, in the southeastern corner of the state. We’ve carved out 10 acres for new shrub habitat in the middle of the 233-acre preserve. Based on what we’ve seen at our other preserves, we’re confident it will increase and diversify the bird population. Click here to read the New London Day’s story from May 30, 2017, about our habitat management work at the sanctuary. Specifically, it will help a half-dozen or more species that are among the fastest-declining in New England. And if we’re lucky, we’ll soon see one of the region’s rare mammals, the New England cottontail, move in as well. Throughout Connecticut and New England, the birds that need shrubby areas for nesting are vanishing. These include Blue-winged Warbler, Chestnut-sided Warbler, Eastern Towhee, Brown Thrasher, Field Sparrow, and Indigo Bunting. The Chaney preserve is mostly mature forest. That’s an important habitat type on its own for species such as Scarlet Tanager, Ovenbird, Hooded Warbler, and Red-eyed Vireo. Our habitat restoration team, lead in the eastern part of the state by Andy Rzeznikiewicz, wanted to create shrub habitat at Chaney without fragmenting the mature forest. Andy looked at aerial photos of the Chaney property and found 10 acres of young forest. Working with Milan Bull, our senior director of science and conservation, he concluded that shrub habitat could be created there without affecting the birds on the rest of the preserve that need mature forest. The first step was to remove trees and stack the brush into piles. That created places for birds and small mammals to find cover. This summer we’ll remove invasive species. Andy manages projects like this at our Bafflin Preserve, at the Center at Pomfret. But those newly-created habitat areas are next to existing shrubby habitat, and so it was easy for the birds to expand into the new areas. The Chaney project is different because it’s in the middle of the forest. But we’ve had an ongoing project exactly like it at the 700-acre Croft preserve, in Goshen. Numerous species that need young, shrubby forest nest there now – in particular, Chestnut-sided Warbler – and Andy expects the same at Chaney. After two or three growing seasons, we’ll be looking for Blue-winged Warbler, Chestnut-sided Warbler, White-eyed Vireo, Indigo Bunting, and others.